The IUIE Sensitive Data Indicator ( ) appears in various areas of publishing and report access management in the IUIE. The definition of sensitive data typically includes Social Security, bank account, and credit card numbers, but may extend to other data; see About sensitive data at IU. As it applies to the IUIE, do not confuse the Sensitive Data Indicator with FERPA or HIPAA restrictions. The Sensitive Data Indicator serves as a reminder to Data Managers that granting access will include this category of data. In most cases where this icon is used, it will be accompanied by a warning note that states sensitive data is being managed or assigned. 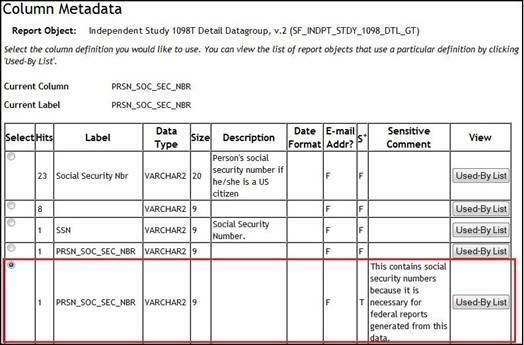 If you are an IUIE publisher, you can mark data as sensitive in a couple different ways. Click Edit Publishing Details, then Columns, and then Edit Column. View Related Columns page: From the Add/Edit Column page, click View Related Definitions to see this page. 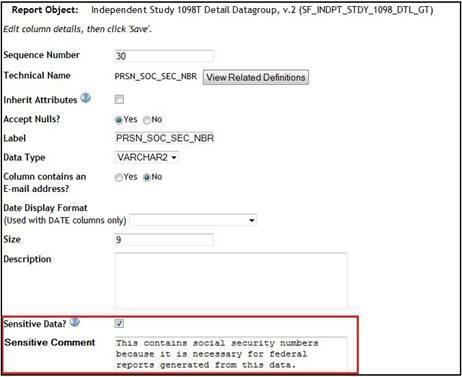 The comment you entered for the sensitive data will appear next to any related column details. Column List: Navigating back out to the column details, you will see the Sensitive Data Indicator next to the column you have designated. Publishing Menu page: Navigating back out to the Edit Publishing Details page, you will see the Sensitive Data Indicator and a message at the top of the page, indicating that the report now contains columns with sensitive data. For all report object types except GT and GTT, click Edit Publishing Details and then Key information. This is document axtn in the Knowledge Base. Last modified on 2019-02-14 13:07:54.